The generally held view is that until fairly recently no one had played a crwth in Wales since around the end of the eighteenth century, but some evidence suggests that it was being played in some corners of Wales later that was originally thought. There were similar instruments to the crwth in Northern Europe at one time. In Scandinavia there was an intrument called the talharpa (which is still played in Estonia today) and the jouhikko in Finland. In England the equivalent was the crowd or crowth . Anyone alive today with a surname like Crowther or Crowder is descended from the old crythorion/crowthers! The old Welsh crwth had six strings: four above the fingerboard to be played with the bow, and two veering to the left, to be plucked with the thumb. Each string had a name: llorfdant, byrdwn y llorfdant, crasdant, byrdwn y crasdant, cyweirdant, and byrdwn y cyweirdant. One important difference between a crwth and a fiddle is that the crwth has a flat bridge, as opposed to a curved bridge on the fiddle. This means that all four strings are played together with the bow, and that each individual string cannot be played separately as with the fiddle. Another difference is the way the instrument is held – not under the chin but lower down, held againt the chest. The strings would be tuned like this: GG’CC’DD’. A recent X-ray investigation by the St Fagans National History Museum identified a resonant chamber under the fingerboard, a feature not known in other stringed instruments. In Wales the crwth was part of the musical tradition for at least a thousand years. 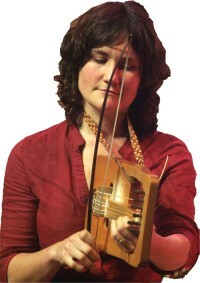 The instrument is named in the laws of Hywel Dda in the tenth century, and it appears that it was popular in the time of Gruffydd ap Cynan two centuries later. Crowthers competed in the famous Eisteddfod of Lord Rhys in Aberteifi in 1176, and we know that 18 crowthers received various degrees in the Caerwys Eisteddfod four hundred years later in 1567. But by the end of the eighteenth century the instument was on its last legs. In a lecture to the London Antiquarian Society in 1770, the antiquarian Daines Barrington had brought a crwth with him to show. There was only one person left in the whole of Wales still playing the instrument, he claimed - a certain John Morgan from Niwbwrch (Newborough), Ynys Môn. At the time he was getting on for 60 years of age. "The instrument will probably die with him in a few years," he said. As in the story of the triple harp, the main threat came from another more modern instrument, which also brought new kinds of music in its wake: the fiddle. The fiddle was lighter and more versatile, and also probably easier to play. Four examples of the crwth have survived. The oldest is the 'Foelas Crwth' from the Pentrefoelas area, which can be seen today in the Museum of Welsh Life, Sain Ffagan. It was made in Llanfihangel Bachellaeth, Gwynedd, and it has a date carved on it: 1742. Another example is in the National Library of Wales, Aberystwyth, one in the Corporation Museum, Warrington, and one in the USA, in the Museum of Fine Arts, Boston. Again, as with the triple harp, a small group of enthusiasts have resurrected the crwth – a much more difficult task than the harp because the tradition had been broken, and all descriptions of technique and repertoire have disappeared. Today, the two main experts on the crwth are Bob Evans from Cardiff and Cass Meurig from Cwm-y-Glo, Caernarfon.